Looking for Pancake Day Recipes? You have found the best ones here! Here are recipes for different types of pancakes and crepes which are made including healthy raspberries to make your Pancake Day (and that of your family) extra special! Recipe Ideas for Pancake Day! Kids, (and adults) always look forward to Shrove Tuesday when they know scrumptious pancakes are on the menu. I have fond memories of my dear mother standing at the stove on Pancake Day, making our favourite pancakes ("Dutch Pancakes"), which all us kids, and our Dad devoured! Pancakes were a favourite meal at our home! For breakfast, brunch, lunch or dinner, these pancake recipes will be sure to please everyone's palate. 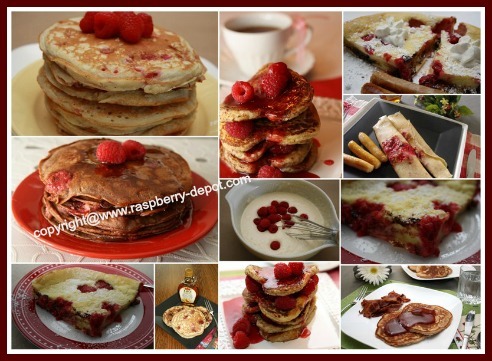 You can top your pancakes with anyone of the easy raspberry sauce and syrup recipes listed below to make your Pancake Day menu even more fun and memorable! Included is a recipe for "heart shaped" valentine pancakes for the romantic! Check out the recipes for "wheat free" and "low fat" pancakes, pancakes with pecans, chocolate pancakes, "puff" pancakes, crepes, flapjacks ... and more!